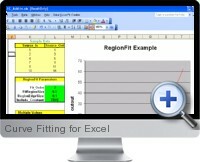 Curve Fitting for Excel is and Excel add-in providing the ability to analyze trends within data and perform curve fitting, interpolation between data points and smoothing functions. The curve fitting add-in is useful for technical analysis of data and as a basis for predictive analysis of business and technical data such as scientific, manufacturing and engineering process analysis. Curve fitting functions include polynomial fits and a versatile local regression (Loess) function by employing a weighted averaging of Y values. Interpolation functions include linear, cubic spline, and a flexible spline that allows to specify the slope at each data point. Data smoothing functions include moving average, median filter, and a Gaussian smoothing filter.